The Four Winns HD220 and HD220 OB offer you multiple power choices, plus smart design. We ran the Four Winns HD220 (a stern drive model) and its sister-ship, the HD220 OB (with outboard power) in Sarasota, FL, as part of a larger Beneteau Power event this fall. 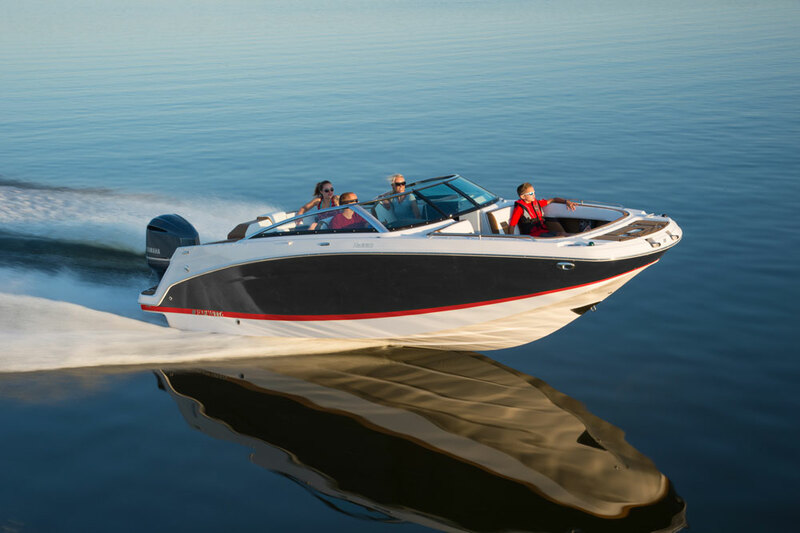 In case you didn’t know it, Beneteau recently bought Four Winns’ parent group Recreational Boat Holdings, a buyout that also included the Wellcraft, Scarab, and Glastron brands. Beneteau seems committed to making the Four Winns brand thrive, so despite the blazing Florida sun, we were excited to hop on board, get out on the water, and see what the HD220 models could do. Our test craft was fitted with a single Mercury Verado 250 HP four-stroke outboard engine, the maximum rated outboard for this boat. 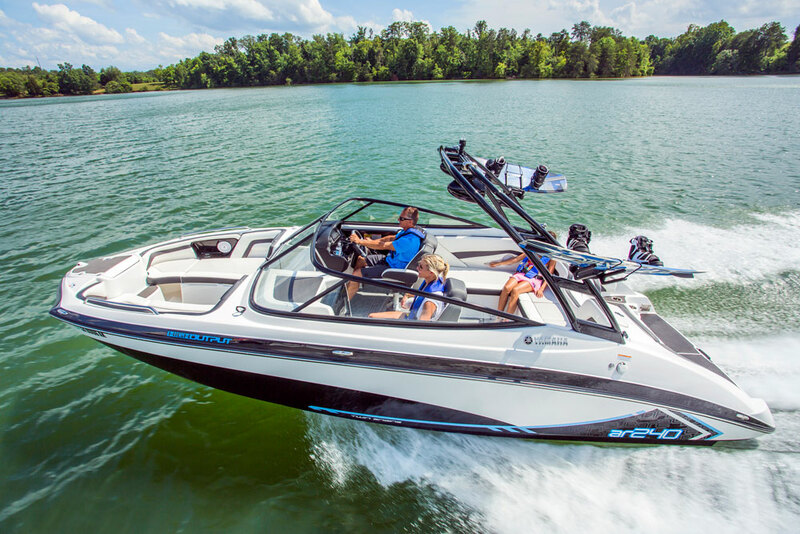 Owners can also select from outboard offerings made by Evinrude and Yamaha. And, as if those power plant options weren’t enough, the stern drive HD220 is available in power ranging from 240 to 350 HP made by Volvo Penta or MerCruiser. The nice thing is that you get virtually the same great deck layout whether you choose outboard or stern drive power. One of the best things about the Verado option is how quietly it purrs away at idle—we could barely hear the engine on our test craft over our conversational cockpit banter. But that silence was soon broken as we powered out into Sarasota Bay and poured on the juice to stretch the HD220 OB’s legs a bit. We accelerated up to 25 MPH in only eight seconds and kept going all the way up to a top speed of 51.4 MPH at 6,400 RPM. Fuel burn is predictably thirsty at the top end, where the big Verado chugs 26.9 GPH. That being said, the HD220 OB has an efficient cruise at around 30 MPH, where only 9.8 gallons per hour of fuel is burned to net 3.0 GPH. That gets you a very respectable theoretical cruising range of around 133 miles with the 44-gallon fuel tank. We were very impressed with how well the HD220 handled a choppy Sarasota Bay and how nimble the boat was when we pressed it hard into turns. After all, with its wide, relatively square bow this boat could generally be described as a deck boat, and we know from experience how rough some low-deadrise deck boats boats can ride. 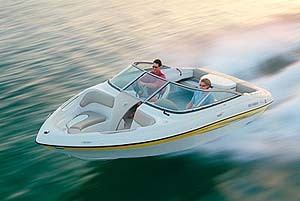 But the HD220 surprised us, slicing through the waves and carving out figure-eight turns with ease. Four Winns tells us to thank its Stable-Vee hull design for that ride, which combines flatter forward sections with a transition to a deep, 20-degree transom deadrise. 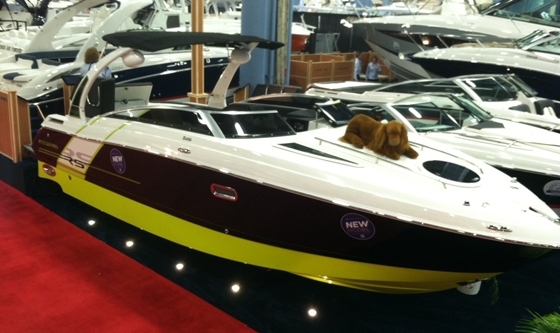 Inside the HD220 is a clever deck plan filled with all sorts of high-end materials and lots of thoughtful touches. At the transom just ahead of the swim platform is an aft-facing lounge. To starboard of the lounge is a walk-through that provides access to the cockpit, only a small step up and then down—we’re not sure what that hump is about—from the swim platform. The cockpit is fairly typical of boats of this design, with an L-shaped lounge aft, a starboard bench, and twin swiveling captain’s chairs just behind the dual consoles. There’s stowage underneath the lounges and bench, which was easy to access thanks to gas-assist struts on the hatches—not something you commonly see on your average bowrider. Whether you choose a stern drive or an outboard, the boat’s essential layout remains the same. Under the port console is a relatively roomy, lighted compartment that houses a portable MSD. While it was easier to get in and out of than we expected on a boat this size, we’d like to see a hullside opening port or some sort of venting scheme here, to keep odors in check. 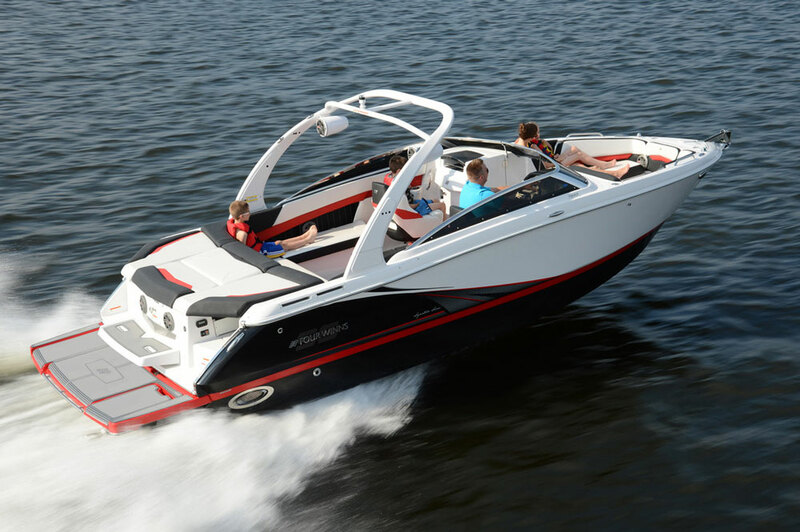 The helm is situated to starboard and features rich leather trim, analog gauges (a digital touch screen LCD control/gauge panel is available) and a graceful wraparound windshield. Walking forward to the bow we found a large centerline stowage locker that’s big enough for wakeboards, surfboards, skis, and other wet gear. We were thrilled to see the hatch for this locker was fitted with a beefy gas-assist strut; it makes stowing and removing gear much easier. The bow area has U-shaped seating that can be converted for snacks or dining with a drop-in table. Backrests forward of the dual consoles mean two sides of that “U” can be used as forward-facing chaise lounges. Under these lounges is more stowage and, like the rest of the boat, the seats that cover the stowage compartments lift up with gas-assist struts. Up on the bow is a neatly concealed, fold-away telescoping ladder to facilitate beach landings. The midday Sarasota sun was melting holes into our brains by the time we started cruising back to the dock, and that made us wonder about arch and/or canvas options for the HD220. A wakeboard tower with color-matched Bimini top is available as an option, as is a conventional fold-down Bimini canvas top. You’ll definitely want one or the other if you live in an area that sees lots of summer heat and sun. …or an outboard, the Four Winns HD220 will fit the bill. 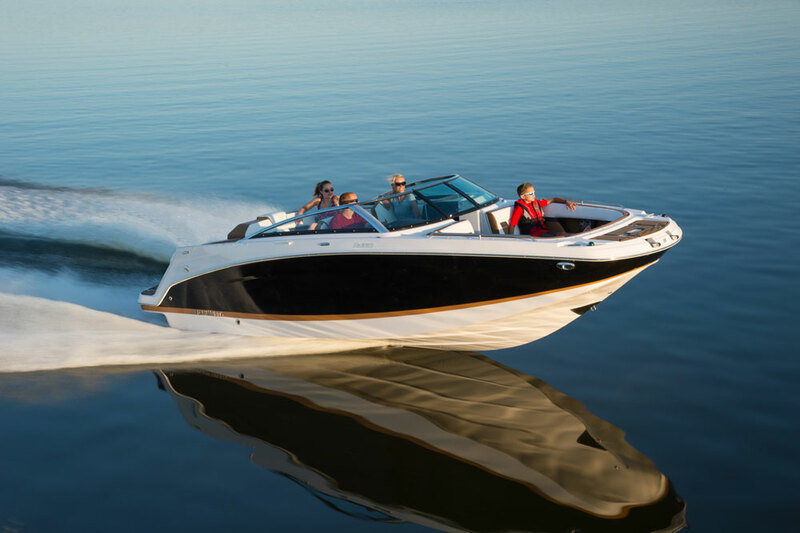 Other Choices: The Sea Ray 220 Sundeck (now tagged the SDX) is also available in both outboard and stern drive options, and will be a natural competitor to the HD220. 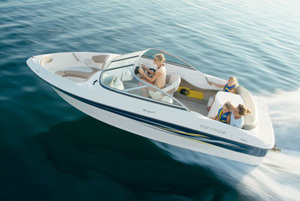 A less expensive and slightly smaller option would be a boat like the Stingray 215LR. See Four Winns HD220 listings. Test conditions: Calm winds, full fuel, four POB.. Performance data courtesy of Yamaha. Power Single Mercury Verado four-stroke outboard, swinging a 17” Mirage Plus stainless-steel propeller.